For modeling in 3ds Max I like to use image planes textured with reference images of my object. Not only for blueprints, but even any reference, because on my laptop screen space is very limited and this way I don’t have to switch between applications, just move my view a little. Setting up those planes is annoying, because you would have to create a material for each and then a plane with the right aspect ratio. This script automates all this, by giving you a little window where you can drag and drop any common image type onto. 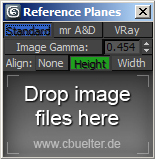 The reference planes will then be created on a line and you can specifiy whether to align height/width of all images. You can also choose a material type and the gamma value that the images are loaded with. Hi, can you please share this plugin? seems interesting one, would like to test it. Thank you Christian! That was quick. Excuse me, not Christian but Christoph. Love this script, such an amazing time saver, thanks. I’m probably being a bit greedy now but is it possible for it to create a multi sub material for each batch of images dropped in? Also wondering would it be difficult to have the materials and planes named after the bitmaps. I have hundreds of bitmaps to drop in as product and this makes life so much easier but it would be soo much better with the above. Amazing! Thank you Christoph. That works great for renaming everything. Unfortunately the multi sub mat is just a multimat of copied materials so cant be assigned without setting all the ID numbers to the planes but not to worry I think I have a work around that will work. Now that everything is named I’ll attached all the planes to create the main multi sub and then detach all elements by named material. Thanks a lot this has been a great help. Great, was just about writing similar, but I found yours ! Time saver ! maybe one suggestion only – will be nice to add icon so it can show up nicely in Toolbar. Hello Christoph, will the script work with 2016 max? Help! The script kinda works but it tiles my Ref image hundreds of times on the plane! Hy Christoph. I have trouble downloading this awesome script, the website says [download id=670] where I suppose a button should be? Many thanks!